Astronomers have struggled for years to give Pluto a place-name in the table of large and small bodies in our Solar System. For 76 years, from its discovery in 1930, Pluto had been classified as a major planet. It was thought of as one of nine major planets in our Solar System along with Mercury, Venus, Earth, Mars, Jupiter, Saturn, Uranus and Neptune. In 1999, the planet-classifying International Astronomical Union moved to reclassify it as a minor planet – like an asteroid or a comet. There was a great public hue and cry and the IAU backed off. Dwarf planet. The IAU didn't give up however. In 2006, it demoted Pluto to dwarf planet. That left only eight major planets in the Solar System and a great deal of public frustration. Plutoids. The IAU astronomers thought and thought, and in 2008 came up with the label plutoid for all dwarf planets lying beyond Neptune. IAU defines plutoid as a type of dwarf planet that orbits the Sun at a distance greater than Neptune and has enough mass for its self-gravity to give it a near-spherical shape. Astronomers wanted to distinguish between rocky dwarf planets like Ceres, which is closer to the Sun in the asteroid belt between Mars and Jupiter, and icy dwarf planets like Pluto. Ceroids. The IAU Committee on Small Body Nomenclature (CSBN), which is responsible for naming minor planets and asteroids, thought of referring to Ceres-like objects as ceroids. However, that name wasn't accepted in 2008 because astronomers believe Ceres is the only object of its kind. Two known icy dwarf planets have been named plutoids – Pluto and Eris – and there are more that remain to be named. The IAU's Working Group for Planetary System Nomenclature (WGPSN) will work with CSBN to name new plutoids and, for that matter, ceroids if any are ever found. The two committees recently worked together to name the plutoid Eris and its satellite Dysnomia. Next up will be names for recently discovered plutoids 2005FY9 and 2003EL61. The 2006 change. Pluto was reclassified into a new category of dwarf planets on August 24, 2006, by some 2,500 astronomers from 75 nations, meeting as the International Astronomical Union. They demoted the small planet leaving only eight major planets in the Solar System – Mercury, Venus, Earth, Mars, Jupiter, Saturn, Uranus and Neptune. has cleared the neighborhood around its orbit. Small Solar System Bodies are all other objects, except satellites, orbiting the Sun. The category includes most of the Solar System asteroids, most Trans-Neptunian Objects, comets, and other small bodies. Pluto was defined as a dwarf planet and recognized as the prototype of a new category of Trans-Neptunian Objects. Pluto circles the Sun in an oblong orbit overlapping the orbit of Neptune's. Historic debate. The International Astronomical Union is the organization responsible for classifying planets. Back in 1999, when the IAU moved to reclassify Pluto as a minor planet -- no more important than, say, an asteroid or a comet -- the public shouted its protest. In the end, the IAU backed down and "decided against assigning any minor planet number to Pluto." Trying afterward to whitewash their attempt to demote Pluto, the IAU said it only had wanted to give Pluto a number for a name. That would have placed it in a group with smaller objects at the outer edge of the Solar System. Pluto had been the most recent major planet to be discovered. It was found by American amateur astronomer Clyde Tombaugh in 1930. After his death in 1997, some astronomers urged the IAU to change the status of Pluto. Trans-Neptunian Objects. Among the roughly 10,000 small asteroids and comets counted to date, Pluto now is merely one among dozens of so-called Trans-Neptunian Objects (NTOs). They cross the orbit of Neptune as they, and all of the bodies in the Solar System, orbit the Sun. Planetary scientists in the American Astronomical Society compose the premier group of space scientists in the United States. In 1999, they didn't like the IAU plan to redefine Pluto from major planet to minor planet. They didn't find much scientific or historical justification for the change in classification. back then, it wasn't just planetary scientists. It turned out that a lot of people had an emotional attachment to Pluto as a major planet. Even beyond the realm of science, astrologers came to the defense of the tiny planet. One astrologer pointed out that, in his line of work, Pluto has the power to bring about life-changing transformations. In the end, an international barrage of e-mail changed the minds of the IAU i9 1999. What is it about Pluto? How does Pluto differ from the major planets? Size. Pluto is less than half the size of any major planet. It's only about two-thirds the size of our Moon. Pluto's diameter is 1,430 miles. That's a mere 18 percent of planet Earth's diameter. Body. Pluto is is a small, cold, dark, frozen, rugged, uneven, craggy place. By comparison, the nearest planets to Pluto in the outer Solar System are giant gas-bags. Pluto seems to be composed mostly of rock and ice with a thin atmosphere of nitrogen, carbon monoxide and methane. Pluto's mass is only 0.2 percent of planet Earth's mass. Orbit. Pluto has a strange orbit. It had been the only one to cross another planet's orbit. Pluto's orbit tilts up from the Solar System plane. It takes Pluto 6 days 9 hours to rotate and 248 Earth years to complete an orbit around the Sun. From 1979 to 1999, Pluto was the eighth planet from the Sun. In 1999, it crossed Neptune's path to again become the Solar System's most distant planet. Although it's now not called a planet, Pluto will remain in that ninth planet position for 228 years before crossing inside Neptune's orbit again. Pluto and Netpune will never collide because their orbits are very different. Pluto can be visualized as above Neptune in the orbital plane. The two planets always are separated by more than a billion miles. Some astronomers have suggested Pluto may have been a moon of Neptune that escaped. Other astronomers say Pluto might be a comet or asteroid which wandered in amongst the planets from a region just outside the Solar System known as the Kuiper Belt, which is said to contain comets that orbit the Sun in a plane similar to the major planets. Shrouded mystery Pluto's origin is unknown. Pluto travels an unusual orbit around the Sun, which sometimes brings it closer to the Sun than the planet Neptune. Scientists say it has an eccentric orbit because it resembles a circle that's been squashed. A year for Pluto -- one revolution around the Sun -- is equivalent to 248 Earth years. Pluto reached its closest point to the Sun in 1989 and is now moving farther away, which eventually will lead its thin atmosphere to freeze and fall to Pluto's surface. Once frozen, that surface probably won't thaw until around 2230 as it swings back closer to the Sun. 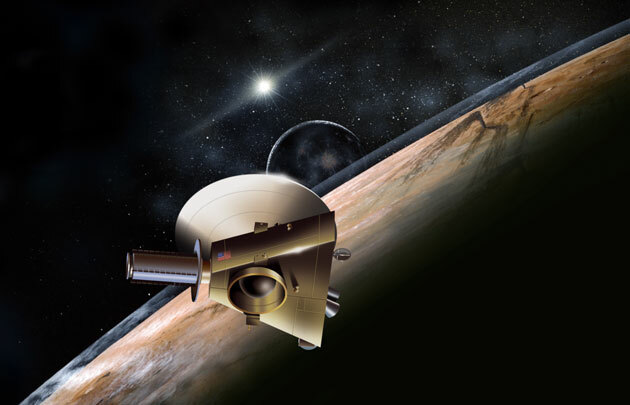 For that reason, proponents wanted to send a robot probe to Pluto now – New Horizons. It's the most mysterious object in our Solar System because, until now, it has been the farthest planet and we know the least about it. The bizarre world boasts an eccentric orbit, seasonal atmosphere and mysterious ice moon. A cold place. Pluto's average surface temperature is about –382°F (43°K). The temperature of Pluto's largest moon, Charon, which has no atmosphere, is –364°F (53°K). Pluto's surface temperature varies widely because of its orbit, which carries it in as close as 30 astronomical units (AU) from the Sun and swings it out as far away as 50 AU. An AU is the average distance from the Earth to the Sun, about 93 million miles. At about three billion miles, Pluto is 30 times farther from the Sun than Earth. Out there, the little dwarf planet receives only 1/1000th the amount of light Earth receives. Never visited. Pluto is the only major planet in our Solar System not yet viewed close-up by a spacecraft. Many of the key questions about Pluto and its natural satellite Charon await the close-up observation of an unmanned interplanetary probe in the second decade of the 21st century. Astronomers' grandchildren. Time is running out for those astronomers who are alive today to study the planet. Pluto travels a highly irregular orbit around the Sun and currently is rushing away from our star. That makes the trip for a robot explorer lengthier and more expensive. If the project were to be postponed much longer, today's scientists wouldn't get another chance in their lifetimes; nor would their grandchildren for more than 200 years. Astronomers already are seeing the planet appear duller. As Pluto recedes from us, it grows colder and much of its thin atmosphere of nitrogen, carbon monoxide, and methane flutters to the surface as frost and snowflakes. Locked in a Deep Freeze. Even as the snow covers up important aspects of Pluto's surface, planetary scientists will lose their chance to study the atmosphere. They calculate the freezing process could take from a few years to a few decades. Afterward, the planet will stay locked in a deep freeze until the 23rd century, when its orbit will bring it back toward the Sun. The scientists also are running out of daylight. Pluto is at its equinox now and the Sun hits almost all parts of the planet as it rotates during a 153-hour-long Plutonian day. But Pluto is moving toward solstice where one hemisphere will be in shadow for decades. Every year the Pluto mission is delayed, 200,000 square kilometers will be lost to view. For instance, if the exploration project were delayed to arrive in 2030, it would be able to see only half as much of Pluto. The robot probe New Horizons is on the way to Pluto. It will fly by Pluto and it's moon Charon and then travel on out into the Kuiper Belt, a ring of icy objects beyond the planets of our Solar System. The Kuiper Belt may hold clues about how the Solar System formed. New Horizons will arrive at Pluto in 2015.